Chayote squash. I’ve seen it in stores my whole life but never knew what to do with it. A couple of weeks ago The Mom-in-law decided that we should pick up some when we hit Pancho Villa Market, mentioning that she hadn’t made it in a long time, but wanted to give it a try again. Really, for the amusement factor alone, this was easily worth it- pick up a new vegetable and give it a go. Even if everyone hates it, you get the fun of watching the people you lovingly serve it to make all sorts of faces, either politely trying to hide their distaste or the outright look of disgust at the thought of trying something new. 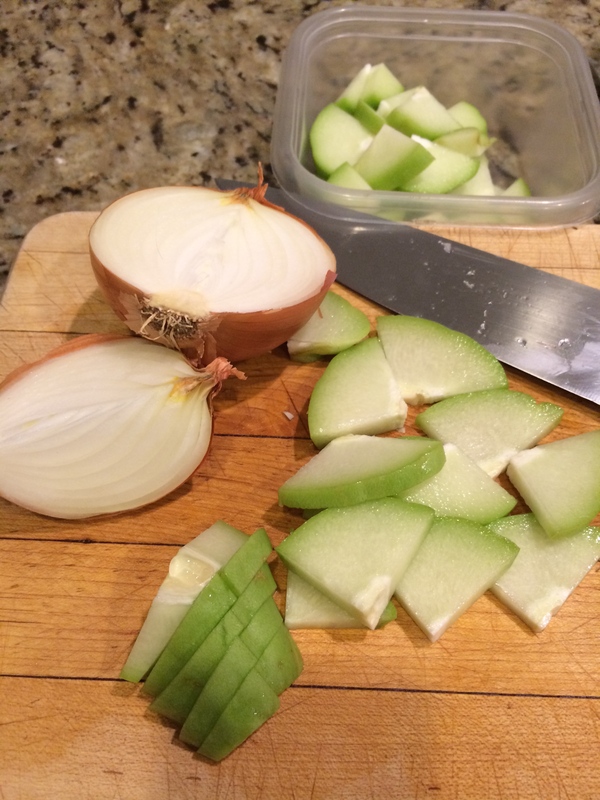 Chayote squash, sliced, ready to sauté with onions. It’s good to be the cook! simply sautéed until tender with onions in butter and olive oil. 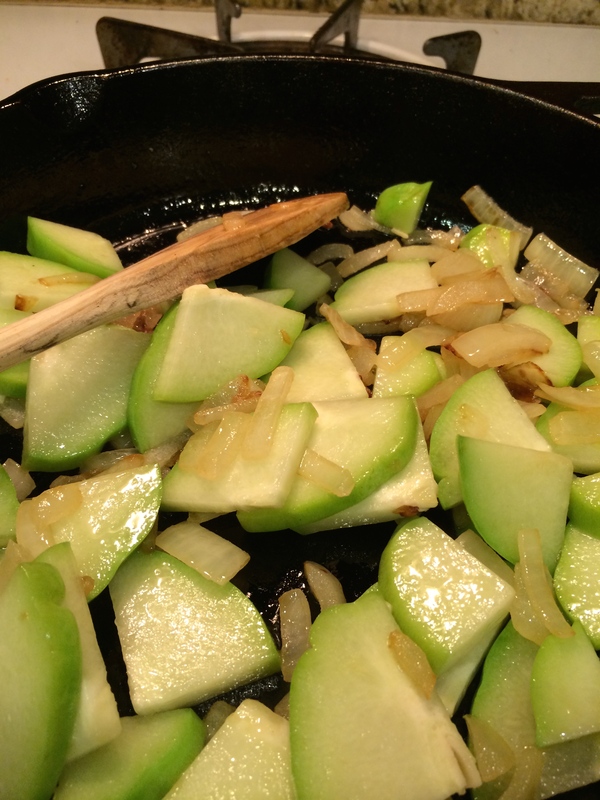 Chayote and onions in the cast iron skillet… the only way to cook. -Chayote’s texture is different from other squash, like zucchini, yellow or crookneck… it is more firm, like that of a sautéed apple, maybe? -If you don’t care for the softer texture of summer squash varieties, chayote is a good squash to try as it is much firmer and not seeded. -Its flavor is very much like zucchini, only more strong. And a bit sweeter. -This would pair well with a squeeze of lemon and maybe some chopped, fresh dill. 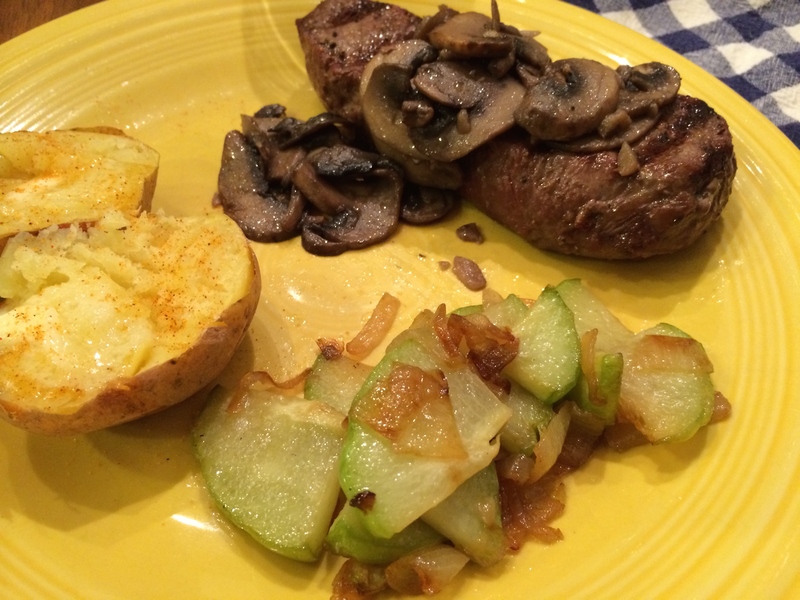 Steak and mushrooms with baked potato and chayote. Good stuff! One chayote was enough for the four of us to enjoy a taste testing, but I would need two for a proper side dish, for sure. The chayote was an overall hit, and we will definitely be cooking it up again.